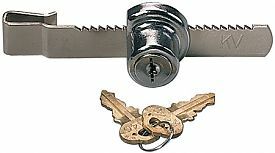 This sliding glass door lock will provide added security to your showcase. It is adjustable from 3/4in. to 3-3/8in. and is non-rekeyable. For 1/4in. thick glass. Keying: This lock is keyed alike. Any quantity you order of this item number will all operate with the same key.